Norway House Cree Nation Chief Marcel Balfour and Council called on Manitoba to establish a "public, open and transparent process" to review the Lake Winnipeg Regulation and Churchill River Diversion Project (LWRCRDP) on October 30th, 2009. In 1973, Manitoba Hydro began construction on the LWCRDP for a series of dams to regulate water levels on Lake Winnipeg and divert the Churchill River under an interim licence granted under the Manitoba Water Power Act. Manitoba Hydro now seeks a 50-year final licence for the Churchill River Diversion Project and a separate licensing process for the regulation of Lake Winnipeg. The Manitoba government requested Norway House Cree Nation participate in consultation about Hydro's request for a final licence that is only for the Churchill-Nelson River Diversion. Chief Balfour stated "In 1973 Manitoba and Canada said the flooding of our lands were justified to provide power needed of the Province. Today, Manitoba Hydro has a very different focus - maximizing export revenues. We will seek...a system-wide look at how Hydro manages and operates rivers and lakes that supply water to Hydro's dams, and the outstanding issues regarding implementation of the (Northern Flood Agreement) Treaty." "Together with the Province's special audit to investigate whistleblower claims of export risks and mismanagement, this will provide everyone with a timely and once in a lifetime opportunity to look at Manitoba Hydro's projects and operations and see if in fact Manitoba Hydro's power is actually 'green'." During 2009 Manitoba Water Stewardship and Manitoba Hydro started to move from interim to permanent water power licences for the Churchill River Diversion (CRD). Only interim water power licences are currently in place. Manitoba Hydro has now requested that current interim water power licences be combined into one permanent licence, for 50 years. The Winnipeg River flows 235 kilometers from the Norman Dam in Kenora Ontario, westward to Lake Winnipeg in Manitoba. Used by First Nations for thousands of years, the river system was important for trade, travel, harvesting, and access to settlements. The river was also a major transportation route for fur traders and early explorers. The first hydroelectric plant on the Winnipeg River was constructed by the Winnipeg Electric Street Railway near Pinawa in 1906. This plant operated until 1951, when it was decommissioned to improve water flow to other Winnipeg River Stations. Six hydroelectric dams bisect the Winnipeg River in Manitoba, generating a total of 583 megawatts annually. From east to west, generating stations are located at Pointe du Bois, Slave Falls, Seven Sisters Falls, McArthur Falls, Great Falls and Pine Falls. All Manitoba dams are owned and operated by Manitoba Hydro. Point du Bois is the oldest power plant still operating on the Winnipeg River. Construction took 20 years being completed in 1926. Stretching 135 meters across the river Point du Bois has 16 turbines and a capacity of 78 megawatts. Slave Falls was constructed between 1928 and 1948. The powerhouse is 180 meters long with a capacity of 67 megawatts. Seven Sisters is the largest Winnipeg River producer of electricity with a capacity of 165 megawatts. The powerhouse was built from 1929 to 1931. Additional units were added between 1948 to 1952, doubling energy output. Today the powerhouse stretches 128 meters across a waterfall drop of 18.6 meters. McArthur was completed in 1955, is the smallest and most recently constructed generating station on the Winnipeg River with a capacity of 55 megawatts. Great Falls was developed by Winnipeg Electric Railway Company between 1914 to 1928. Now owned by Manitoba Hydro, the powerhouse is 116 meters long, has six turbines, and has a capacity of 131 megawatts. Pine Falls is the last station along the Winnipeg River before it empties into Lake Winnipeg 13 kilometers away. It was completed in 1952, stretches 151 meters, houses six turbine generators and has a capacity of 88 megawatts. Manitoba's Public Utility Board(PUB) held hearings over four months in 2014 to review Manitoba Hydro's development plan. The PUB grudgingly agreed to the Keeyask dam being built, largely based on the significant amount already spent on the project. The Clean Environment Commission report regarding its Keeyask hearings came out after the PUB was finished its review, and Keeyask received its environmental licence during summer 2014. The Manitoba government, according to CEO Thompson, accepted 14 of the extensive recommendations in the PUB report. including the recommendation to not build Conawapa. "There was a recommendation to halt Conawapa development and stop further expenditures pending the outcome of an enhanced integrated resource planning review." During the annual Crown Corporation Committee meetings of the Manitoba Legislature Wednesday September 24, Hydro CEO Scott Thompson referred repeatedly to the future Conawapa project during his answers to questions from Opposition MLAs. "We've also started site prep on the northern convertor station, and work is well under way on the southern converter station, the Riel Converter Station, where we've been engaged in work there for some time because we've been sectionalizing the supply system around the city of Winnipeg, and that (Riel) will be the location of the southern terminus of Bipole III." "The construction power station at Keewatinoow, the northern converter station, was put in service in July, and as I'd mentioned, site preparation is well under way"
Mr. Thompson indicated that Bipole III was being built for reliability of the Hydro system in Manitoba. Throughout the CEC hearings Manitoba Hydro personnel indicated that Bipole III was also being built for export of electricity. The northern converter station, inside the Bipole III licence is for Conawapa, not for the Keeyask project, which will utilize an upgraded existing converter station. Continuing to build the northern converter station is essentially building for the Conawap generation station. This is occurring regardless of the PUB review and recommendation to government. The additional $ 1 Billion cost for Bipole III, for a total of $ 4.6 Billion, which Manitoba Hydro announced recently, would be significantly less if the Conawapa converter station was not built. Manitoba's Public Utilities Board (PUB) issued its report, and the Manitoba government has released the report that reviews Manitoba Hydro's development plan. Hearings were held over three months. This was the first time a ‘Needs for and Alternatives to' review of Manitoba Hydro projects has been conducted, with at least some of them yet to be approved. The mandate for the PUB hearings did not include the Bipole III 1400 km 500 kv transmission system from northern Manitoba to Winnipeg. The PUB did review the Keeyask and Conawapa Generation Stations with auxiliary transmission, export sales, energy efficiency programs, and the intended new transmission line between Manitoba and Minnesota. The two new converter stations for the Hydro system in Manitoba were included in the Bipole III licence and were therefore not reviewed. The PUB recommendations (pg 249 of the report) start with a clear recommendation that the Manitoba government not approve Manitoba Hydro's proposed preferred Development Plan." Acknowledging the in service date for the Keeyask Generation Station is perhaps 5 years early based on domestic energy need within Manitoba, the PUB recommends that "Manitoba Hydro proceed with the construction of the Keeyask Project to achieve a 2019 in service date." The PUB report notes that $ 1.2B is already spent on this project. The Keeyask Generation Project received its environmental licence the same day as the PUB report was made public. Despite there already being 4 transmission interconnections between Manitoba and the United States customers for Manitoba Hydro, the PUB recommended that "the Manitoba government authorize Manitoba Hydro to proceed with the 750 MW US transmission interconnection project for 2020 in service date." The newest 500 kv ( 750 MW) transmission line between Manitoba and Minnesota. built in the 1980s for export sales, currently has a different destination point in the US, and appears to be under utilized. About the Conawapa Generation Station, the PUB recommended that the government of Manitoba not approve construction of the Conawapa Project and the North South Transmission Project. The PUB stated, ‘nor should existing sunk costs become a justification for Conawapa." The PUB has indicated that no further funds should be spent on Conawapa at this time. Manitoba Wildlands audience may remember the Conawapa was filed as a project under the Manitoba Environment Act in the early 1990's based on export to Ontario. It was not built at that time either. There are 6 PUB recommendations regarding demand side management of power resources in Manitoba, and energy efficiency programs. Essentially the PUB recommended establishment of a "regulated arms length responsible for developing and implementing the demand side management targets." (These targets are also subject of PUB recommendations. Rate-payer impacts are subject of another 3 PUB recommendations to government. In its closing the PUB report indicates it is "now time for to determine and build a more diversified (energy) resource portfolio" Solar and wind energy should be an integrated part of the future of Manitoba's energy portfolio, according to the PUB report. The PUB report includes concerns about low income Manitobans with dramatically high energy bills, and Manitoba Hydro assumptions about the US market for imports of Manitoba energy. The PUB also recommended against building any natural gas generation plants in southern Manitoba. The report chastises Manitoba Hydro for not providing a complete demand side management set of scenarios that could be compared to the preferred development plan elements. Manitoba Wildlands has not yet undertaken an analysis of whether the PUB report fulfills the extensive terms of reference for its hearings. To date we agreed with many of the observations, concerns and recommendations. See links below for Pubic Utilities Board and Manitoba Wildlands products, and hearings information. It is not yet clear whether the Manitoba government will follow the recommendation to stop spending money on Conawapa. There is also no recommendation in the PUB report about the two $ 600 M converter stations included in the Bipole III licence. 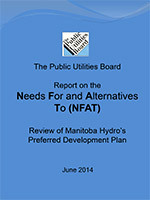 The Public Utilities Board(PUB) hearings, called a Needs for an Alternatives To ( NFAT) review of Manitoba Hydro's detailed development plan began Monday March 3 in Winnipeg, at the PUB hearings room. One day, February 27, was made available for public presenters. Transcripts, evidence, formal written questions for the utility, rulings, and the terms of reference from the Manitoba government for this review are all available on the PUB website. The review incudes social, economic, and some environmental requirements. The Keeyask Generation Station, The Conawapa Generation Station, and the new transmission system to Minnesota to export energy into the US are the main elements in this development plan. Bipole III was not included in the terms of reference. Hearings are booked to continue through March, April and May, 2014. The PUB is currently deciding when and where it will tour in northern Manitoba in spring 2014. The PUB report is supposed to be filed with the Manitoba government for June 2014. Manitoba Wildlands is providing a chronology chart of the decisions, announcements etc regarding the PUB review of Manitoba Hydro's Development Plan. The Manitoba government announced April 24, 2013 the Public Utilities Board will undertake a detailed review Manitoba Hydro's development plan. The plan includes two new generation stations ( Keeyask and Conawapa), various sets of AC transmission lines, a new $ 1Billion connection to the United States, and export sales of hydro energy to US utilities. While estimates vary the Plan could cost as much as $ 20 B Canadian. Commitment for this Needs For and Alternatives To (NFAT) review was made by the former deputy premier in January 2011. In July 2011 Premier Selinger renewed the commitment. In November 2012 the government indicated the NFAT review would be organized through the Public Utilities Board, with details to follow. While submissions from Intervenors and the first pre hearing conference are almost immediate, Manitoba Hydro does not file its information under end of summer 2013. The public hearings are likely to be held between February and April 2013, with a final report, and rulings due June 2014. The Bipole III transmission project to provide a 1400 km direct current system from northern Manitoba to converter stations near Winnipeg is not included in the NFAT review. The scope for the NFAT terms of reference require that Manitoba Hydro's Plan must be "justified as superior to potential alternatives that could fulfill the ( energy ) need." Manitoba's Clean Energy Strategy, Climate Change and Emissions Reduction Act, and Principles of Sustainable Development from the Sustainable Development Act are factors in the assessment, as are the "reasonableness of the modeling of export contract sale prices, and terms; and "socio-economic impacts and benefits of the Plan and alternatives to northern and aboriginal communities." The PUB will be using its own independent expert consultants, while Intervenors will provide expert witnesses, evidence, and analysis during the proceedings and hearings. 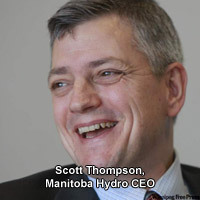 Manitoba Hydro supplies Manitobans with electricity and natural gas, while also exporting hydro electricity to neighbouring provinces and states. Manitoba Hydro has signed a 'term sheet' with Minnesota Power, an Allete Inc unit, to provide 250 megawatts of hydro power over 15 year period starting in 2020. Minnesota Power and Manitoba Hydro currently operate under a 50 megawatt agreement expiring in 2015. Manitoba Hydro has existing contracts with Xcel Energy of Minnesota including an 'up to' 500 megawatts contract, expired and renewed in 2005. Xcel Energy currently receives 375 megawatts of power under a 10-year contract with Manitoba Hydro. Manitoba Hydro plans include constructing Keeyask generation station on the Nelson River, about 30 kilometres west of Gillam, Manitoba. Keeyask, a $3.5 billion hydro plant will supply 620 megawatts of energy and involves substantial flooding of lands. On July 31, 2007, Manitoba Hydro submitted a proposal under the Environment Act for the Pointe du Bois Modernization project. The existing Pointe du Bois Generating Station is the oldest hydroelectric plant operating in Manitoba. It began producing power in 1911, and is one of six dams on the Winnipeg River. an estimated cost of $800 million, with a 2015 planned in-service date for new facilities. Manitoba Hydro also says "Transmission Line improvements are required regardless of the modernization project. Separate approval of these improvements, as appropriate, will be requested in the future" (page 2 Draft Scoping Document). In addition, Manitoba Hydro has filed a separate proposal for Slave Falls Tramway project, which involves decommissioning of the 11 km long tramway line that provides access to Slave Fall Generating Station via Pointe du Bois and construction of an all-weather road. Manitoba Hydro is seeking separate regulatory approval for these projects. This creates a risk that environmental impacts of the development (all three components) will not be considered as a whole. The public was invited to comment on the Draft Scoping Document. The public comment period closed on September 25, 2007. Manitoba Hydro has not provided information about the intentions to rebuild all 6 dams on the Winnipeg River. Total costs could exceed $8 billion. Conawapa generation station, on the Nelson River, was shelved in 1992 following Ontario’s decision to cancel a 1,000-megawatt energy contract with Manitoba Hydro. However, the November 2006 Speech from the Throne leaves little doubt regarding the Manitoba Government's intention to revive the project. Today we are proud to announce that we will build the Conawapa dam. Energy projections for export and domestic markets indicate the time is right for Manitoba Hydro to move forward with another major generating station... Once in operation, Conawapa will generate 1,250 megawatts of electricity. 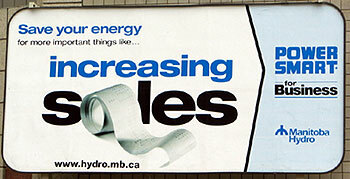 Prior to the November 2006 statements, news reports were referring to high level discussions between senior government officials in Manitoba and Ontario regarding Manitoba Hydro projects and current and future energy shortages for southern Ontario. It has been estimated that the cost of realizing Conawapa would be $5 billion (+ / -) plus transmission line costs. In addition, during Clean Environment Commission licensing hearings for the Wuskwatim projects in 2004, Manitoba Hydro indicated the required notice under the Northern Flood Agreement regarding intent to start planning for Conawapa had been given to the five signatory First Nations (Split Lake, Nelson House, York Factory, Norway House and Cross Lake). Split Lake First Nation (Tataskweyak Cree Nation) received notification from Manitoba Hydro dated January 6, 2004. Mr. Ed Wojczynski, Division Manager of Power Planning and Development for Manitoba Hydro stated on Day Two of the Wuskwatim hearings (March 2, 2004) the decision to restart Conawapa had been made in the previous couple of months. Manitoba Hydro and Tataskweyak Cree Nation (TCN) continue to state that a decision to proceed with an environmental impact assessment for Conawapa is not a decision to go ahead with the project. The final decision will be made following the regulatory approvals process. Development of Conawapa and export of power to Ontario would require more transmission capacity. This would probably necessitate construction of a Manitoba-Ontario power grid (i.e. part of the proposed east-west power grid). Three options are being discussed to facilitate power transmission. Transmission could travel south on the east side of Lake Winnipeg and east to Kenora. Another option is a transmission line from northern Manitoba to northern Ontario and then to Sault Ste. Marie or Thunder Bay. The third option would involve lines crossing into Ontario, south of the dam and into southern Ontario. No public steps have been taken concerning an upgraded Manitoba-Ontario power grid since October 2005. Visit Manitoba Wildlands' Hydro Research page and the document Hydropower Transmission in Manitoba for detailed information regarding future transmission options. Hydro has made no final development, design or construction decisions on Conawapa Generating Station, slated to become the largest hydro-electric project ever built in northern Manitoba. No agreements have been reached with local communities but environmental field studies and monitoring were ongoing at the Conawapa site during the summer of 2008 and public, engineering and environmental consultation activities are underway. The station's earliest in-service date would be 2022 under the current schedule. Manitoba Hydro has begun the formal planning process with Fox Lake Cree Nation, York Factory First Nation, Tataskweyak Cree Nation, War Lake First Nation and Shamattawa First Nation. The Conawapa Working Group held a two-day Conawapa Hydraulic Impacts Workshop with Fox Lake Cree Nation on September 5-6, 2009 to review affected areas and proposed water levels. In April 2008 Manitoba Hydro signed a formal term sheet with Wisconsin Public Service to provide up to 500 MW of hydro power over 15 years, starting in 2018. The sale ensures a need for new hydroelectric facilities in northern Manitoba and a new transmission line running into the United States. Since 1947, Fox Lake has been requesting reserve land in the Gillam area. Inaction from the federal government allowed Manitoba Hydro Electric Board to claim all lands in and around Gilliam for Nelson River Power Development, near the Conawpa site. Without reserve land Fox Lake was unable to participate in the Northern Flood Agreement in which Manitoba Hydro and the provincial and federal governments agreed to compensate five other Manitoba First Nations impacted by Hydro development. On the Fox Lake Cree Nation website, Chief Neepin said "a Gilliam Reserve would have given our community some much needed cohesion and legitimacy during the troubled decades of Hydro development." Manitoba Hydro is actively seeking new export opportunities of hydro electricity to neighbouring provinces and States. The Conawapa dam is considered key to Manitoba's economic future with preliminary design and fieldwork already well underway. 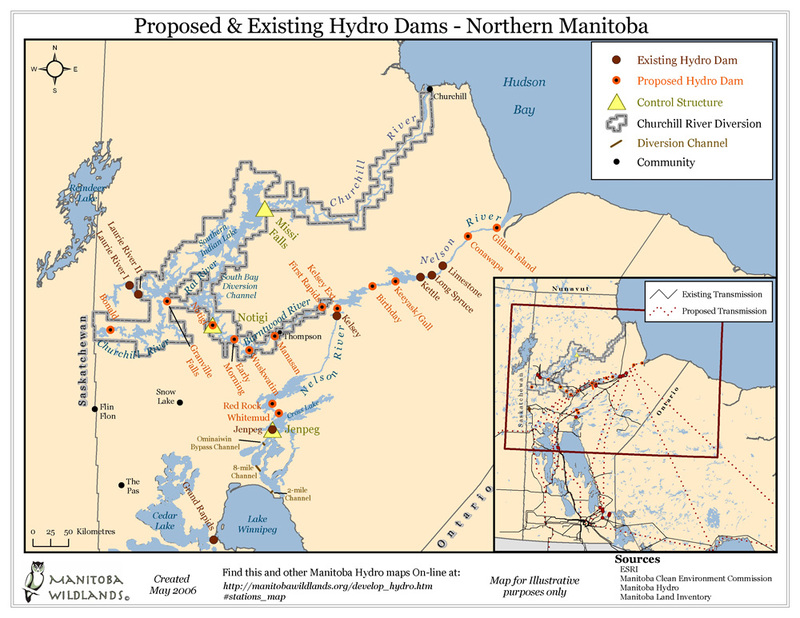 Manitoba Hydro was planning development of the 100-megawatt Notigi Generation Project, to be finished by 2009, located near the Wuskwatim site. According to Manitoba Hydro's website, they have "determined that Notigi will not proceed in the immediate future, and NCN and Manitoba Hydro are not pursuing further negotiations on the project at this time." Notigi remains a control structure for the Churchill River Diversion at the south end of Notigi Lake, below South Indian Lake. Gillam Island generation station is a potential 1,000-megawatt project on the lower Nelson River. Development of this project would require the construction of a new High Voltage Direct Current (HVDC) line and would likely trigger the construction of Bipole IV Transmission Project and possibly Bipole V Transmission Project. During the CEC Wuskwatim hearings in March 2004, Manitoba Hydro executives confirmed that the Gillam Island generation station is an upcoming project on the Nelson River, along with Keyask (Gull) and Conawapa. Media reports since 2003 have suggested the federal government may make a financial commitment to provide federal funds to develop an east-west power grid. A major component of the proposed east-west power grid would be a new transmission line from Manitoba to southern Ontario. In June 2003, then Premier Eves of Ontario and Premier Doer of Manitoba signed a memorandum of understanding which sets out objectives and activity for joint hydro development and transfer of power from Manitoba to Ontario. The MOU potentially includes work on future dams, including Conawapa, and the east - west transmission grid for Canada. A feasibility study commissioned by Manitoba and Ontario under the MOU between Manitoba and Ontario was to be completed by November 30, 2003. The preliminary report (dated September 2004) outlining the potential for energy transfers between Manitoba and Ontario was released in Winnipeg September 31, 2004. The report examines possible power supply arrangements between Manitoba and Ontario, in particular generation and transmission infrastructure to meet a growing need for power in Ontario. The report recommends proceeding to the next stage of the 'Clean Energy Transfer Initiative' ('CETI'), which would involve detailed engineering and cost analysis, especially regarding transmission line options, comprehensive consultations, the initiation of commercial negotiations, and political and policy decisions. In a September 30, 2004 press release, the Manitoba Government indicated that Manitoba and Ontario would proceed with a detailed technical study to follow-up on the feasibility study. As of July 2009, no public information about this technical study exists. Visit Manitoba Wildlands' Hydro Research page and the document Clean Energy Transfer Initiative - Manitoba Wildlands Review for an analysis of the Clean Energy Transfer report. Manitoba Premier Gary Doer addressed the Empire Club in Toronto in October 2, 2004. 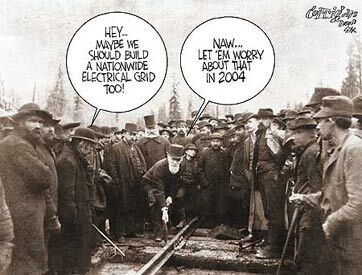 The potential and justification for an east-west grid featured prominently in his speech. The Premier emphasized the issues of reliability and accessibility of hydro power within Canada, environmental benefits and meeting Kyoto targets, and economic feasibility as primary reasons for moving forward on planning for an east-west transmission grid amongst Canadian provinces. Manitoba and Ontario signed an agreement that will see Manitoba transfer $500 million in clean, renewable hydro power to Ontario - up to 400 MW annually, based on transmission infrastructure upgrades between the two provinces. The agreement, announced in October 2005, is the first phase of a larger 1,500 to 3,000 megawatt (MW) intended power sale - the Clean Energy Transfer Initiative (CETI) -under discussion by the two provinces (see section above for more details). Current transmission infrastructure will allow for power sales to Ontario in 2006 of 150 MW. This will increase to 400 MW annually by 2009 (pending requirements for environmental licenses) as transmission upgrades come online between Winnipeg and Thunder Bay. Manitoba and Ontario have stated that they will continue to discuss the second phase of the CETI, which would require the construction of new generating facilities in northern Manitoba, as well as new transmission infrastructure. As of July 2009, the federal government has not committed any financial support for the CETI and the agreement between Ontario and Manitoba for the first phase of the CETI is not publicly available. No public steps have been taken concerning a Manitoba-Ontario power grid since June 2005. In March of 2006, Ontario Ministry of Energy (MOE) retained consultants on behalf of the Nishnawbe Aski Nation (NAN) Chiefs Steering Committee and the MOE to undertake a report to identify and review the potential impacts of the proposal to import renewable power and energy, from Manitoba into Ontario on affected Ontario First Nations. This energy transfer proposal is known as the Clean Energy Transfer Initiative, or CETI and involves the transfer of 1500MW - 3000MW of hydro electric power, by way of a high voltage (HV) transmission line corridor, from the proposed new Conawapa hydro electric facility on the Nelson River in North-eastern Manitoba, through northern Ontario, to Sudbury. The document was prepared for the purposes of further engaging First Nations in the review of the CETI initiative.